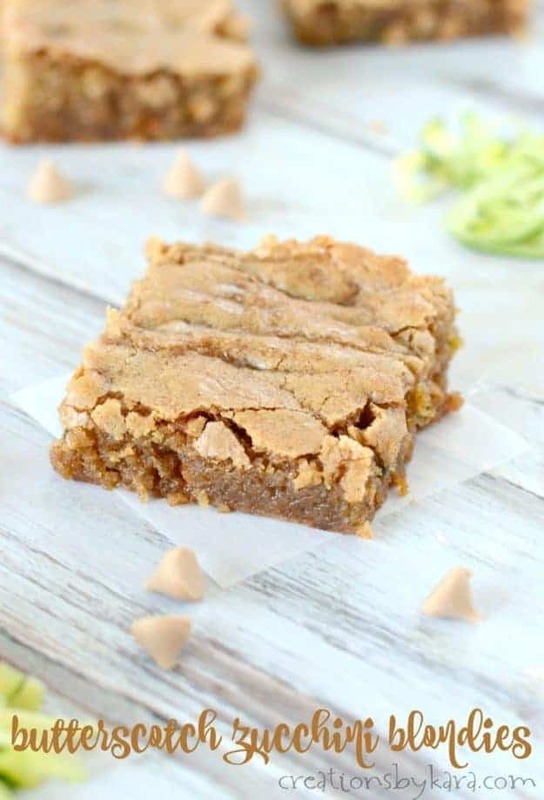 Butterscotch Zucchini Blondies – after one bite of these chewy bars, you’ll be gathering zucchini instead of giving it away. They are heavenly! Since we just moved into our house a few weeks ago, we don’t have a garden. Thankfully my parents shared some of their zucchini with us. My kids will actually eat it steamed with butter, salt, and pepper, but they really love it when I grate it up and use it in baked goods! 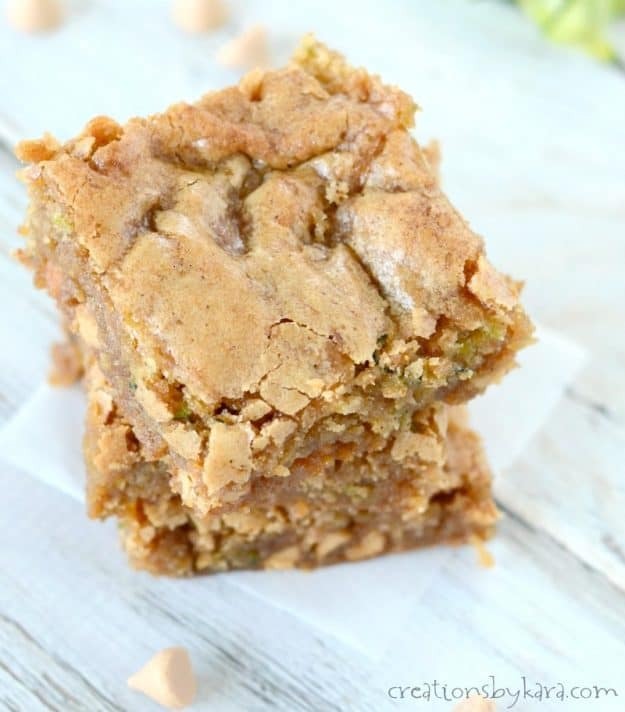 These butterscotch zucchini blondies are a new favorite. I think I say that a lot with zucchini recipes, but this time I really mean it. They are seriously fantastic!! The brown sugar gives them a nice caramel flavor and adds to the chewiness factor. I browned the butter for an extra depth of flavor. It makes them extra yummy, but if you are in a pinch, you can just melt the butter. My family gobbled these bars up, and I the ones I sent to work with my husband got rave reviews as well. 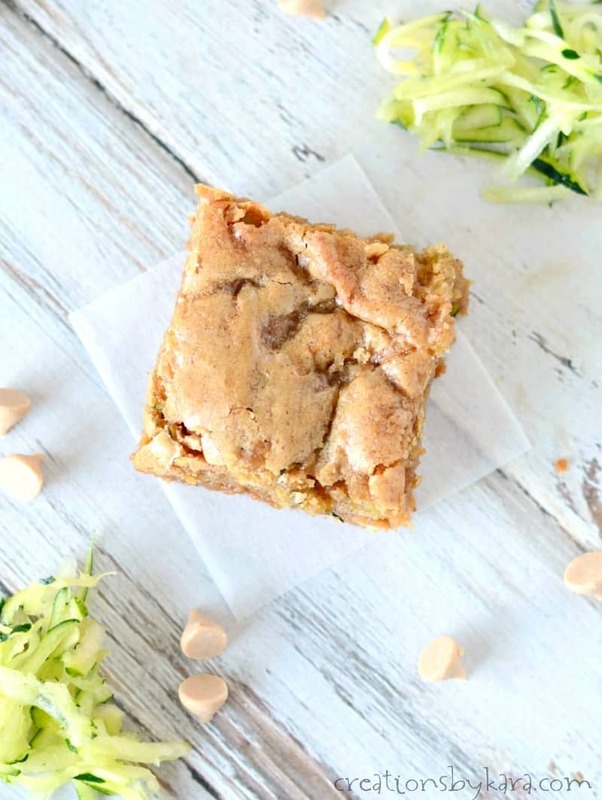 Kids and adults alike love these tasty zucchini bars! 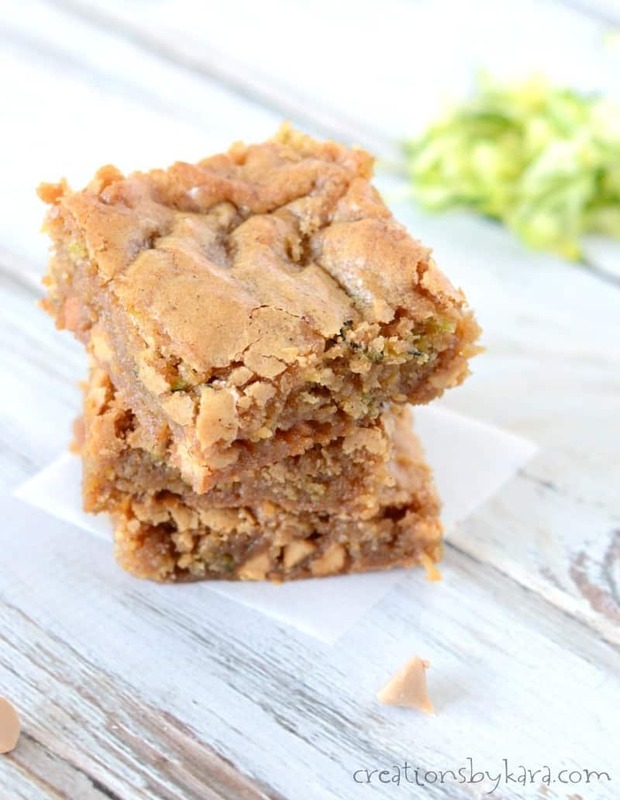 Rich chewy butterscotch blondies made with shredded zucchini. Cook butter in a saucepan over medium heat till it starts to turn golden brown, stirring occasionally. Add the brown sugar. Remove from heat and let cool for 5-10 minutes. Pour butter/sugar mixture into a mixing bowl. Whisk in the egg and vanilla. Add the dry ingredients and mix together. Stir in the zucchini and chips. Spread batter in a well greased 9x13" pan. Bake in a preheated 350° oven for about 30 minutes or till the middle is set. Did you know that today is National Zucchini Day? 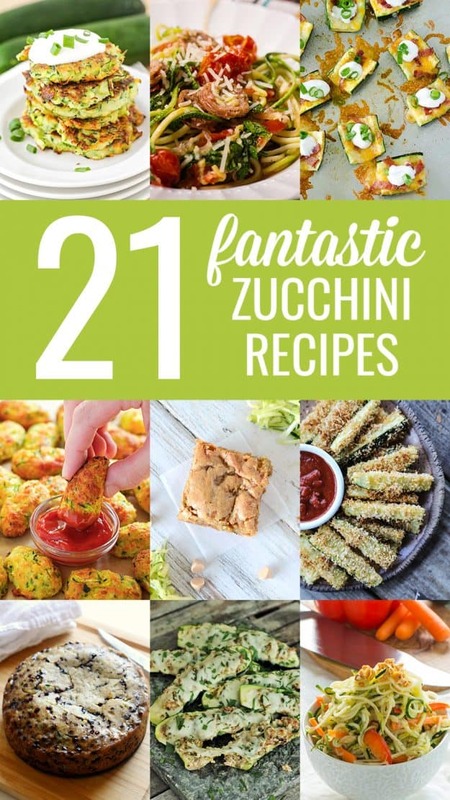 Whether you are on the sharing end or the receiving end of zucchini, you will love these recipes from my blogger friends! These were awesome! Second time around I used a combo of white chocolate chips and sea salt caramel chips. AMAZING! 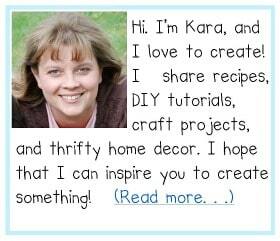 Will continue to make these! Made these just like the recipe said and they turned out like coffee cake not at all like blondies or the picture. They are good but not at all what I was hoping for. Dying to try these! 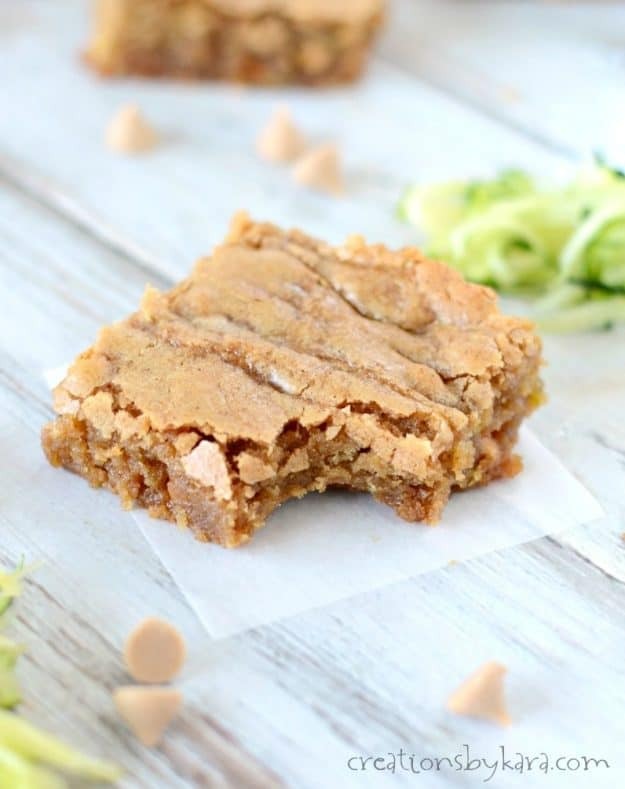 Love the combo of zucchini and butterscotch! It is a tasty combo, that’s for sure! These look delicious! I love blondies. Great idea to use zucchini in them. Can’t wait to try!